Pre-Owned Gear & B-Stock. Roland TD-25 Electronic Set. 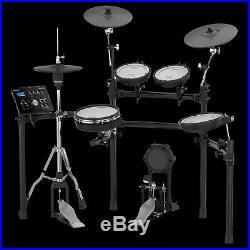 Roland V-Drums TD-25K Electronic Drum Set. Unrivaled Sound and Expressiveness. The TD-25K delivers a superior drumming experience, thanks to Roland’s SuperNATURAL technology with Behavior Modeling inherited from the flagship TD-30. High-End Feel and Playability. When you sit down at the TD-25K, you’ll enjoy expressive playability that rivals high-end V-Drums sets. Call Up Kits and Start Playing Immediately. With its no-nonsense interface, the TD-25K’s sound module lets you enjoy playing great sounds for any music right away. Customize Kits for Your Personal Style. The TD-25K makes it simple to edit sounds to suit your playing touch or a specific style of music. Just hit a pad to call up the sound assigned to it, and then use the module’s knobs to select instruments and tweak tuning, muffling, and levels. Play Along with Tracks and Record Audio Performances. Want a little jamming music to play along with? Just load up a USB memory stick with favorite WAV/MP3 songs and get lost in playing for hours. In addition to normal playback, you can loop sections you’d like to work on, or slow the playback speed to more easily learn fast fills and articulations. Advanced SuperNATURAL sound engine based on the flagship TD-30. Sound quality and expressiveness equivalent to the top-of-the-line V-Drums. Simple, logical interface for easily swapping and customizing each drum and cymbal in a kit. PDX-100 10-inch mesh-head snare pad with support for positional sensing and rim shot/cross stick playing. Three mesh-head tom pads: two PDX-6 6.5-inch pads for rack toms and one PDX-8 8-inch pad for floor tom. VH-11 V-Hi-Hat mounts on a standard acoustic hi-hat stand and offers realistic motion and a natural acoustic feel. CY-12C 12-inch crash cymbal with natural swinging motion, edge/bow sensors, and choke control; CY-13R 13-inch ride cymbal with natural swinging motion and edge/bow/bell triggering. KD-9 kick pad with cloth head for great feel and solid playability. Play along with WAV/MP3 songs and capture drum performances as audio tracks to a USB memory stick. Build drumming skills with the onboard Coach function. Quick-access metronome with dedicated screen, on/off button, and tempo knob. USB host port for audio/MIDI communication with a computer DOES NOT INCLUDE KICK PEDAL OR HI-HAT STAND. Merchandise and packaging MUST be in the same condition as when received. Alto Music reserves the right to refuse any return if it appears the item has been used. Software (if unsealed or registered). Harmonicas, Mouthpieces, Earbuds/Earphones/Headphones(if unsealed), or any item that may come in contact with the mouth, ears or nose. There are no warranties for the following items. The item “Roland V-Drums TD-25KS Electronic Drum Set” is in sale since Saturday, February 2, 2019. This item is in the category “Musical Instruments & Gear\Percussion\Drums\Electronic Drums”. The seller is “altomusic” and is located in Middletown, New York. This item can be shipped to United States.